Want to connect with Shawna? 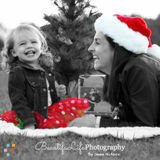 I am a highly-committed photographer serving Loudoun County, Fairfax County and the DC/Metro area. Experienced in various types of photography, including family portraits, milestones, and lifestyle shoots, I'm known for my distinctive perspective and ability to bring out each subject's independent expression of the self. My goal is to capture the unique quality and personality of every individual I photograph. Please reach to me for questions and/or to schedule your session today!! Elegant with a touch of whimsical magic! I am a creative photographer who tends to go for the unique angles and perspectives when I shoot special events.